Welcome to Tile Preservation by Larry Mobley. I am also a petroglyph and mosaic artist. To visit my artist site at larrymobley.com please click here. 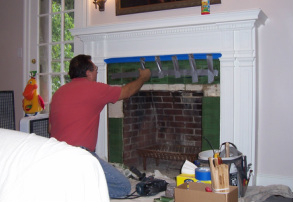 Larry removing Grubey tile from a fireplace. For hundreds of years, tile has been more than functional. It was an expression of art, beauty, and history. But, unfortunate as it may be, its permanency is not guaranteed. Often these beautiful works of art were installed in buildings that are not standing the test of time. These buildings are now slated to be destroyed, and the tile often goes with it. Happily, there is increasing interest in saving these historically and aesthetically important, irreplaceable tiles. A reclamation specialist can remove these tiles from their base support with modern equipment and assure their preservation. Larry Mobley is one of the few reclamation specialist currently working in the United States.